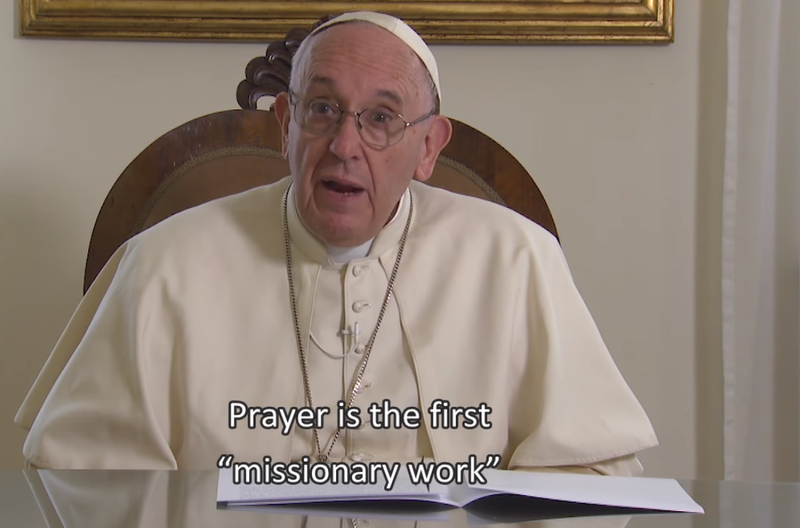 Pope Francis on May 28, 2018, asked for prayers for missionaries, stressing their important work around the world. His remarks came in a video message sent for the opening of the General Assembly of the Pontifical Mission Societies, taking place in the Fraterna Domus of Sacrofano, Rome, through June 2, 2018. “Why are the Pontifical Mission Societies important?” Pope Francis asked. His answer: “They are important first and foremost because we must pray for missionaries, for the evangelizing action of the Church. Prayer is the first ‘missionary work’- the first – that every Christian can and must do, and it is also the most effective, even though this cannot be measured. Indeed, the principal agent of evangelization is the Holy Spirit, and we are called upon to collaborate with Him. With this brief message, I would like to present to you an important but little-known aspect of the mission of the Church: the Pontifical Mission Societies. Since the earliest times, the mutual support between local Churches, engaged in announcing and bearing witness to the Gospel, has been a sign of the universal Church. Indeed mission, inspired by the Spirit of the Risen Lord, enlarges the spaces of faith and charity unto the farthest confines of the earth. In the nineteenth century, the proclamation of Christ received a new impulse from the founding of the Pontifical Mission Societies, with the specific aim of praying and acting in a concrete way to support the evangelization of new territories. These Societies were recognized as Pontifical by Pope Pius XI, who in this way wished to underline that Peter’s Successor has at heart the mission of the Church towards all peoples. And it is still thus! The Pontifical Mission Societies continue today this important service that began two hundred years ago. They are present in 120 countries with National Directors, coordinated by international Secretariats at the Holy See. Why are the Pontifical Mission Societies important? They are important first and foremost because we must pray for missionaries, for the evangelizing action of the Church. Prayer is the first “missionary work”- the first – that every Christian can and must do, and it is also the most effective, even though this cannot be measured. Indeed, the principal agent of evangelization is the Holy Spirit, and we are called upon to collaborate with Him. In addition, these Societies guarantee on behalf of the Holy Father an equitable distribution of aid, so that all the Churches in the world have a minimum level of assistance for evangelization, for the sacraments, for their own priests, the seminaries, for pastoral work, and for catechists. Support to the missionaries who evangelize, and support above all with prayer, so that the Holy Spirit may be present. It is He Who drives evangelization forward. Therefore I encourage you all to collaborate in our common task of proclaiming the Gospel and supporting the young Churches through the work of these Pontifical Mission Societies. In this way, in every population, the Church will continue to open up to all and to proclaim with joy the Good News of Jesus Christ, Saviour of the world. I thank you all from my heart!